Can't get enough? We can't either, so here's a list of haunts and all-things horror that are happening ALL YEAR ROUND and all around the world. 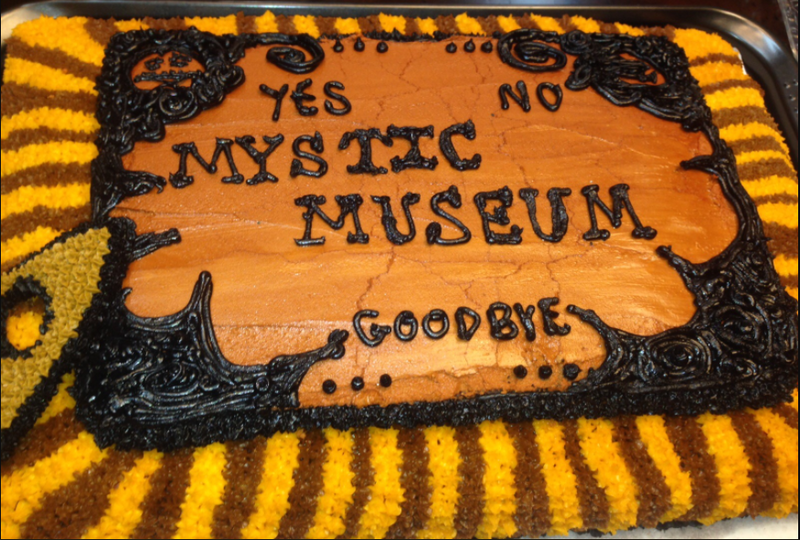 Do you know an "off-season" Convention, Haunt, or Experience we should include? Let us know and we'll add you to our list. ATTENTION CAMPERS! You are hereby invited to report to Zombie Joe's Underground Theatre Group for their all-new, immersive experience - CAMP WHITSIT! This whimsical, coming-of-age immersive experience hearkens back to a simpler, more terrifying time and place where courageous visitors become Scouts through a journey of initiation and worldly merit! Based on actual events. Campers interested in taking part in the initiation process to become full-fledged scouts will be required to report to Zombie Joe's Underground Theatre Group on one of (3) Evenings - (FRIDAY, SATURDAY & SUNDAY - Beginning at 8:30pm, JANUARY 19, 20 & 21, 2018). Upon entering, chaperones will be on-hand to offer campers the required standard release before entry. Once checked in, qualified Counselors will guide eager and courageous campers through a haunted-rite of passage that is whimsical, freakishly-strange, psychedelic...and filled with worldly merit! HAuNTcon brings together people who love Haunted Houses, Halloween and scaring people, for a fun-filled four days and nights of Haunted Attraction Tours, Haunter Education, Halloween Tradeshow, Haunted Garage Sale, FX Makeup and Prop Building Demonstrations, rounded out by Networking opportunities like the amazing annual Costume Ball. DESCRIPTION: This is a feature length, completely interactive and highly customized celebration of some of humanity’s most deprived and darkest yearnings. The Lust Experience: Anointment features the highest standard of professional, cinema quality directing, writing and set pieces brought to you by the same team that created The Tension Experience, an event that critics hailed as one of the premiere immersive experiences of 2016. Join us knowing nothing or as a seasoned veteran looking to unlock even more secrets about our our living, breathing world full of intrigue and limitless possibilities. The dozens of characters, endless choices and personalized narratives ensure that the thin line between your passions and fears will soon disappear entirely. This is a 21 and up event and will include extremely risqué and macabre subject matter. Guests may be offered the option to stay longer than their allotted hour and half run time. Come dressed to impress and attend in the attire that makes you feel the most attractive. Anointment is not recommended for audience members who are not comfortable standing, walking, running or being alone. Because of the immersive nature of this performance, audience members will be required to stand for long periods of time, navigate tight spaces and encounter claustrophobic situations. By purchasing a ticket you agree and understand that you may be placed in physical, emotional and sexual situations that are designed to elicit a strong emotional reaction. A safe word will be provided and may be used if any scene becomes too intense. You will not be compensated or refunded if you choose to end your experience. We do not take responsibility for patrons’ personal items and advise you to keep this in mind when dressing for the show and bringing valuables onto the property. NO ONE UNDER 21 IS ADMITTED. All participants MUST present a valid ID at the door. If a patron is asked for ID and cannot produce it, the patron will be turned away without a refund. All Participants will be required to sign a waiver before beginning their journey. You MUST dress to impress! 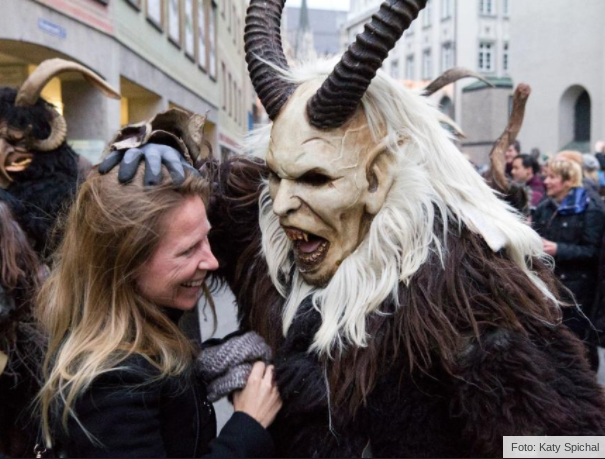 DESCRIPTION: 300 masked beings frighten passers-by during the big traditional run of the Krampusses via the Munich Christmas Market on Dec 10th, 3-5pm. The scary fellows of the 1st Munich Krampus group Sparifankerl Pass with their shaggy fur costumes will run around a second time on Dec 17th, 4-5pm. 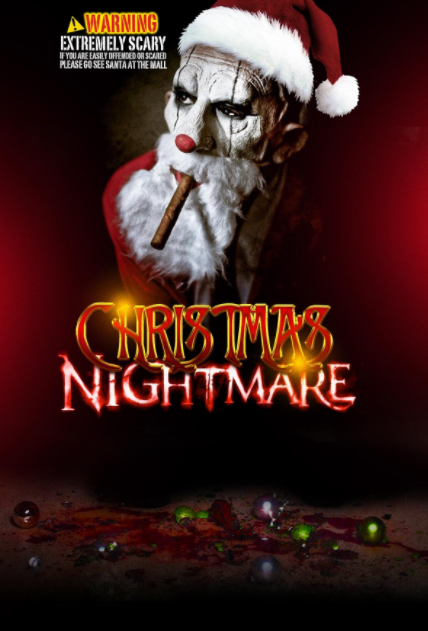 DESCRIPTION: Chamber of Horrors NY is transforming their 2 haunted attractions into a Christmas Horror Extravaganza. 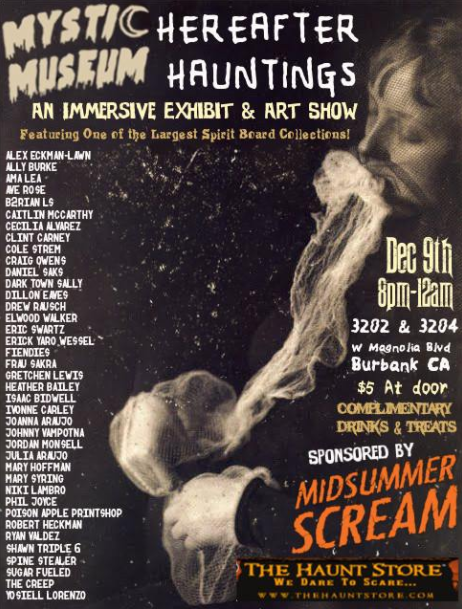 A VeryScary XMAS is a holiday fund-raising event sure to send shivers down anyone’s spine. December 8th, 9th, 15th and 16th the show is open from 8pm until 11pm. Tales of Terror the first haunted attraction is run by Granny Muerte who has come to town with her killer stories. A disturbing collection of holiday frights such as Krampuses, Killer Snowmen, Christmas Killers, Zombies and more! Santa’s Workshop is the second haunted attraction run by the jolly man himself. Santa has transformed the lovable workshop into an industrial factory cranking out demonic toys. When asked what we can expect at a Very Scary XMAS, Robert responded “Killer Snowman, A Krampus for sure, Cannibal Christmas Dinners and even a Christmas light electrocution!”. Guests will enter the building to and be greeted with the sound of Christmas carols however they have an eerie tone about them. Once inside guests will make their way through the Tales of Terror, A Victorian mansion saturated in festive fright and horrendous holiday decor. Once they make it through they will venture through Santa’s workshop which is an industrial factory with demonic toys running around. Killer Teddy bears, Maniac Wooden Soldiers and more! Oh my! When guests finish there Haunted Attraction excursion they will have their picture taken with a demented Santa Claus! After learning about the theft the cast and crew who put together chamber of horrors donated most of their pay for the Halloween weekend to help out the owners but one individual knew it wasn’t enough. Robert Frankenberg jumped into action with the veterans of the haunted attraction and created Crooked Christmas. A fundraiser to ensure Chamber of Horrors returns for the 2018 season and the owners will be ok through the winter months. “This is about more then the business of scaring people, Matt has children. Christmas time is about giving back so that is exactly what we are doing. We are going to save these gentleman’s families” said Robert Frankenberg one of the events Managers. DESCRIPTION: The Haunted Mansion gets a merry makeover inspired by Tim Burton’s The Nightmare Before Christmas—through early 2018! Explore the estate at its eeriest with tons of frightfully festive touches—courtesy of Jack Skellington!